An electrical sub panel - also known as a service sub panel or circuit breaker sub panel - are often required to create new space for circuit breakers and to optimize your electrical system. 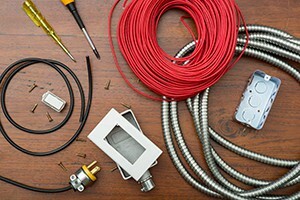 Direct Energy Home Services, will evaluate your sub panel repair needs, and service or install sub panels for your home. In essence, an electrical sub-panel can be thought of as a mini service panel. Its basic structure is the same as a service panel, with the main feeder wire leading into bus bars and circuit breakers. Branch wire circuits lead off the circuit breakers into various parts of the house. A circuit breaker sub panel does not provide additional electricity to the house; it is feeding off of the main electrical panel. A typical amperage and voltage for a sub-panel is 30 amp., 240 volts. create new space for circuit breakers, but in a physically separate location if the main service panel does not have enough space to hold breakers for any new circuits you intend to install. to provide a sense of clarity and separation of service from the main electrical panel. Usually, a circuit breaker sub panel will service a separate area of your home that has a discrete function, such as a kitchen, office, or addition. By installing a circuit breaker sub panel, you make it clear which circuit breakers and branch circuits apply to which parts of the house. Direct Energy Home Services, can evaluate your needs for any renovation project to determine the feasibility of installing sub panels and assess any sub panel repair issues.